For many teams, the college football season is halfway over! That means it’s time to start talking about the Heisman Trophy race. The 2016 season was an anomaly in Heisman races. When we debuted our Heisman Poll, Lamar Jackson was the front-runner. The season ebbed and flowed, but one thing remained constant: Lamar Jackson stayed at the top of the Heisman poll. Deshaun Watson made a late run but, ultimately, Jackson led from our season premiere to our final ballot. This year, like most, promises to be more wide-open. The preseason field this season had a ton of big-name quarterbacks returning. Lamar Jackson, Baker Mayfield, Sam Darnold, Josh Rose, Jalen Hurts, J.T. Barrett, Jake Browning and Mason Rudolph all had their sights set on the Heisman. Some of the top running backs included Saquon Barkley, Royce Freeman, Derrius Guice, Bryce Love, Kamryn Pettway, Nick Chubb and Bo Scarbrough. After six weeks, some of the names above have been eliminated and some have become front-runners. Other contenders have also emerged for the 83rd Heisman Trophy race. Let’s take a look at our inaugural poll for 2017 and see how our voters see the race through six weeks of the college football season. Last week: 75 yards rushing on 16 carries with 2 rushing TD. He may be coming off his worst performance of the year, but Barkley remains one of the most dangerous players in the country in a variety of ways. Barkley will be off this week but his candidacy will be put on the line in the weeks after the bye week with Michigan and Ohio State in back-to-back weeks. Saquon Barkley hasn’t been quite as ridiculous with his rushing numbers over the last two weeks, and Bryce Love has certainly made this a close call. But Barkley still gets the nod right now. The Penn State running back continues to look like he’s on another level than anyone else on the field, and ranks No.2 in the country in all-purpose yards. And, while I’m not a big team performance guy in terms of judging one player, Barkley gets — say, a tiebreaker — boost over Love with the Nittany Lions currently ranked No. 3 in the country. After a pedestrian week for Barkley’s standards, he still leads the way and controls his own destiny with games against Michigan and Ohio State coming up. While many will argue that his special teams’ contributions aren’t necessary, they put a cherry on top of his resume and only beef up his case as the front-runner. If Barkley was the favorite coming in, he’s done nothing to warrant a slide in his first five games. Two consecutive games under 100 yards raise an eyebrow (especially when most of his yardage against Northwestern was on one run). But if Barkley puts up big numbers against Michigan, Ohio State and Michigan State, no one’s going to remember that and he very likely will have cinched the Heisman. He’ll have three more games after that to pad his stats against lesser competition too. Last week: 152 yards rushing on 20 carries (7.6 ypc) with 1 rushing TD. Season: 1240 yards rushing on 118 carries (10.51 ypc) with 9 rushing TD. Love proved that he’s the best player in the nation with his performance against Utah. Even though the Ute defense — which came into the game ranked eighth in the country against the run — sold out to stop the run, Love still managed to finish the contest with 152 yards on 18 carries. For the year, he’s averaging 206.67 yards per game and 10.51 yards per carry. Any questions? Stanford’s weak start has cost Love some voter support. Even in the two losses for the Cardinal, Love averaged 9.4 ypc against USC and 14.1 against SDSU. Love is doing more with less support. Over the last three games he’s really taken it to the next level by averaging 238 yards in that stretch. The Cardinal are leaning more on Love and it’s working. Right now, Love is putting up video game stats and he’s the front runner for the trophy in my book. Last week: 170 yards rushing on 27 carries (6.3 ypc) and 2 rushing TD. Season: 993 yards rushing on 143 carries (6.94 ypc) with 9 rushing TD. 16 receptions with 2 receiving TD. 1 kick-off return for TD. Penny has been doing unreal things at 1 AM Eastern after way too many Heisman voters have gone to sleep. It’s back-and-forth between him and Love right now (Barkley fell back a bit with a lackluster game against Northwestern), but Penny has been slightly more versatile–with 85 more all-purpose yards. – Last year, the Season Premiere of our poll featured Lamar Jackson in first place with a commanding lead over his peers. He garnered over 44% of the vote and had a 27% lead over the number two vote-getter (Jabrill Peppers). – This year, the question is if the field is deeper for the Heisman or is it just that no one has really gripped the nation like Jackson did in 2016? Regardless, only 2.08% separates first and second place which is a stark contrast to last season. – The leader of our poll, Saquon Barkley, is idle this week. This means that his competitors have a huge opportunity to gain some ground. 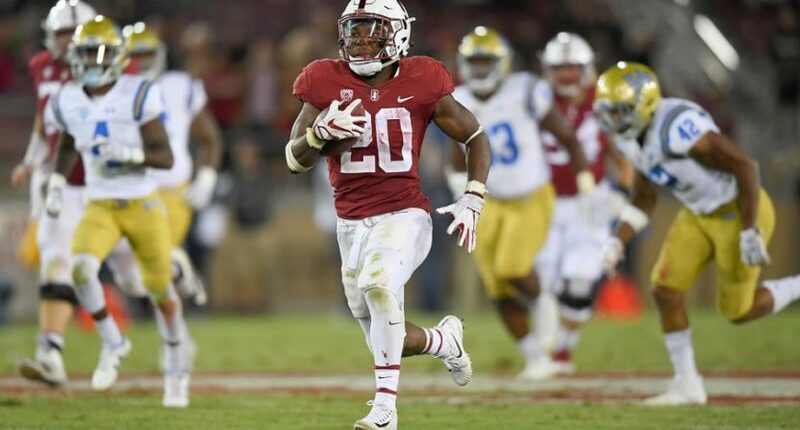 – Bryce Love and Stanford take on divisional rival Oregon. Baker Mayfield and Oklahoma have a chance to get back on the winning track against rival Texas. Rashaad Penny and SDSU have a big-time Mountain West showdown against Boise State. All three contenders have a great opportunity to gain ground on the Idle Barkley. – Keep an eye on: Luke Falk (QB/Washington State). Falk was our only player to get a first place vote but not place on our leaderboard. Many are still skeptical of the Cougars and Falk but they have a very favorable upcoming schedule and he has a great chance to start making believers out of the doubters.